When I was a little girl, part of me was always secretly glad to have a sick day from school. I'd lie on the couch and watch tv all day. Bewitched was my favorite, even though the show seemed to have only one story line-- Darrin called around 5pm to say he was bringing his boss and some clients home for dinner and needed to impress them. So Samantha turned on her witchy powers (she must have had some fantastic powers to keep Tabitha happily sitting in her high chair all afternoon) and whipped up something magical. Tonight I feel like the 60s housewife without the superpowers. Eddie's got some potential co-worker and his wife showing up in less than an hour. Will he be home to meet them? Unlikely, considering that I haven't heard a word from him all day. So I'm supposed to entertain them (and if you've been reading the blog for a while, you know that I fear nothing more than social situations with strangers from Eddie's work), show them around my pristine house (yeah right, we've had five kids here all day. I just spent five minutes finding my feet under inches of mud after following Isaac into the yard to turn off a hose), and chat them up until dinner time. The dinner where we're then taking four kids to the country club. My mom asked if I'd bought them coordinating outfits, so we'd look like we fit in. Right now Isaac is wearing a red and white striped shirt and red and blue underpants, so he's got the matching thing down. I'm thinking of dosing someone with ipecac so I could get out of going. But that would be mean, wouldn't it? 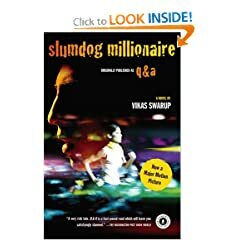 If I picked up Vikas Swarup's novel when it was published under the name Q&A, I wonder how long it would have taken me to realize that it was actually the novel on which Slumdog Millionaire was based. Some of the basics are the same-- there's a quiz show, the questions the main character answers seem almost cosmically determined based on experiences he had in his life. There's someone named Salim in the book and a bad guy named Maman. Other than that, almost everything is different. If you're a fan of the movie, I recommend reading it, just for the sake of contrast. I can't decide which telling of the story I like better-- I loved the film, and the story of the brothers and their divergent paths and final "it is written" summation. I liked the way the love story started in early childhood. That wasn't part of the book. In fact, I'm not sure whether Ram Muhammad Thomas (the protagonist) has more of Jamal or Salim in him. I think that if I had read the book first, I may not have liked the movie as much. It reminds me of the film v. book versions of A Beautiful Mind, which captured the spirit, but not the events, of the book. Either way, read the book and watch the film. Both are worth it. Ed is a 19-year-old Australian guy without much going for him. His dad just died and his mom prefers his siblings. His friends are losers. He works as a cab driver and lives in a shack. Then he gets a series of messages from an unknown sender. When he figures out the puzzle and accomplishes the mission of these messages, he finds purpose and meaning in his life. My friend Blue came over a few weeks ago, bearing this book, with the instructions that I had to read it immediately because it would change my life. 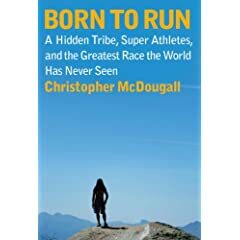 It's actually several stories: the story of Christopher McDougall, aging runner, who wants to figure out why he keeps getting hurt every time he laces up his running shoes; the story of the Tarahumara Indians of Mexico, who still manage 50-mile runs in their fifties and sixties in some of the world's most challenging terrain, and do it with smiles on their faces; the story of ultra-runners, who don't find marathons challenging enough and push themselves through hundred-mile races; the story of the running industry (complete with why your running shoes might be hurting you), the story of Caballo Blanco, a gringo from Colorado who met some Tarahumara at an ultra race, followed them to Mexico, and stayed, always dreaming of getting the world's best ultra runners and the Tarahumara together to run the world's greatest race. A few weeks later, I'm still thinking about this book. When I get up in the morning to do my daily six or seven miles, I think about running light, fast, easy, and being happy while I do it. I'm making lists of books to read with titles like Chi Running. I'm very interested in the idea of running barefoot, although I haven't tried it yet. I'm even thinking about the possiblity of not being capped at 26.2 miles (seriously?). But even if my running never changes, I'm so glad that I read this story. During our moving frenzy a few months ago, I sat down one night while Eddie was working and watched Doubt on pay per view. Well, at least I tried to watch it. But I fell asleep within the first fifteen minutes. 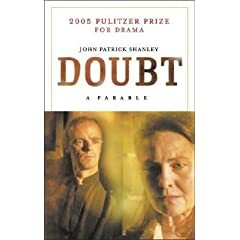 But it's been on my reading list for a while, so last week while we were on our Shakespeare festival trip, I read Doubt. I remember listening to a Fresh Air interview a few months ago with Phillip Seymour Hoffman about his acting in the film version, and it made the play sound so interesting and engrossing. Once again, it just didn't grip me. Maybe it was the contrast of watching a really fantastic stage performance of Comedy of Errors with the slim spareness of the script. Maybe if watching Hoffman and Adams and Streep bring it to life would change my opinion. But I have a feeling I'd have to tackle it at a time when I'm not moving and exhausted. Mudbound is exactly the kind of book I always like. A strong and somewhat flawed woman, struggling with a difficult situation. Laura McAllan is a city girl, living in Memphis just after the end of WWII, when her husband Henry comes home one day and announces that the family is moving to the new farm he purchased in rural Mississippi. Laura tries to make the best of her life on the farm, but when two soldiers return to the farm from the war (Henry's brother Jamie and Ronsel, the son of a black tenant family) everyone's lives become a lot more complicated. Laura, Jamie, Ronsel, and Ronsel's parents are all interesting, complicated and sympathetic characters, who make the book come alive and are definitely worth the time invested in reading the novel. I feel like I didn't understand Henry as well as I would have liked. 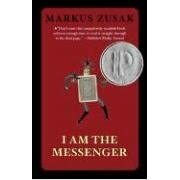 Jordan opens the novel with the story of Laura and Henry's courtship, stressing that both were sort of past their expiration dates in terms of marriageable age (and may therefore have jumped at the opportunity despite not being perfectly matched) but it seems that they communication issues. I wish that Henry were as fully-rounded and complicated a character as his wife. And Pappy (Henry's father) frankly baffles me. I couldn't figure out whether he was a backwoods redneck or a closed-minded townie. Either way, he was mean. And either way, you should read Mudbound. 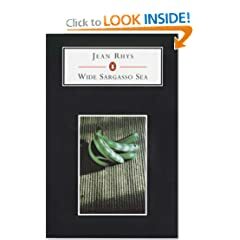 I read The Wide Sargasso Sea for Segullah's annual retreat. But we got to talking so much about other things that we never had a chance to sit down and talk about it. That's sad because the book really deserves discussion. It's the story of Mr. Rochester of Jane Eyre fame (although he is never named in the book, weirdly enough-- in fact, unless you were an Eyre aficionado or read the introduction, you might never realize that it was the same character) and Bertha Mason, you know, the crazy first wife in the attic. While fiction related to great historical works of fiction is pretty much a genre of its own right now (think Ahab's Wife, Mr Darcy Takes a Wife, even the horrendous Scarlett, which I actually adored when I first read it as a teenager), Rhys's book was published years before filling out the backstory of a lesser-known literary character was a popular thing to do. As far as the book itself goes, Rochester is a much less sympathetic character than he is in Jane Eyre. While his lot in life (second son, no inheritance) steered him forcefully toward marriage with a woman he hardly knew, his character basically gives up just weeks after the union, after discovering the skeletons in her closet. With the right climate and the right husband, could Bertha Mason have been more than a crazy woman in the attic? Rhys definitely seems to think so. I'm glad I read the book for several reasons-- the descriptive language is beautiful, it's short but somewhat challenging (so therefore good for a more adventurous sort of book club, especially of Eyre lovers), and it definitely establishes the conventions for a group of great books that have followed it. 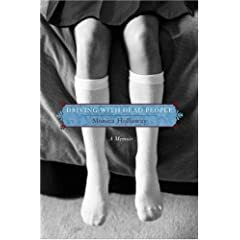 In Driving with Dead People Monica Holloway recounts her childhood-- her father's scary rages, her mother's detached way of dealing with the situation, her trashy extended family, her siblings' various reactions to growing up in a dysfunctional environment. Her parents divorced when Monica (the youngest) was an early teen, and her dad moved out, her mom moved out, and she and her next older sister raised themselves. Weird, huh? 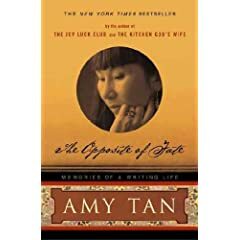 She did gain some stability from her best friend's family, who ran a mortuary. The thing that surprised me most about Holloway's book was not the experiences she had as a child (though those were pretty shocking), it was the rancor she expressed for both of her parents, who are still presumably alive and kicking in Ohio. As a new writer, I've struggled with what is and isn't appropriate to say in print about my family (rule of thumb: anything that could possibly be construed as negative will be taken that way, so don't go there), but Holloway seems not to care. It's almost as if telling the story is her way of exacting revenge on parents who never acted like the parents she and her siblings really needed. But there was never any snow. With every blog post that I write. And may your hamstrings never feel too tight. I love running up the hills and in the canyons, but what I wouldn't give for an easy flat run one of these days. I am officially a hill wussy. I stopped four times today to catch my breath while out on a run. I guess I'm not as tough as I thought. It's a challenge, right? An opportunity to grow? By next year, I hope to be whipping up the side of the mountains. Or at least not staggering.